Asparagus was prized as a gourmet delight and for its medicinal properties in ancient times. The tender green spears which originated in the Mediterranean region are grown throughout much of the world today and enjoyed in many households. Asparagus is a member of the Lily family. These green, regal looking veggies have fleshy spears topped with bud-like compact heads and are often used as “designer” vegetables for that gourmet dish you are serving your guests. These tender green spears are enjoyed for their succulent taste and tenderness but also for their nutrition. If you’re thinking about becoming pregnant or are in the early stages of pregnancy, make asparagus a frequent addition to your meals. A cup of asparagus is a good source of folate. Inadequate folate during pregnancy has been linked to several birth defects, including neural tube defects like spina bifida. Folate is also important for a healthy cardiovascular system because it lowers the levels of homocysteine which research shows has been linked to an increased risk for heart disease. Asparagus stalks should be rounded, and neither fat nor twisted. Look for firm, thin stems with deep green or purplish closed tips. The cut ends should not be too woody, although a little woodiness at the base prevents the stalk from drying out. Once trimmed and cooked, asparagus loses about half its total weight, so buy about one-half pound per person when purchasing the fresh vegetable for use as a main dish. When you buy asparagus, plan to use it within a day or two after purchasing so it will retain its flavour. Store in the refrigerator with the ends wrapped in a damp paper towel, and be sure to place the asparagus in the back of the refrigerator away from any light since folate is destroyed by exposure to air, heat or light. Asparagus can be served hot or cold, in pastas or salads or as a side dish of vegetables. 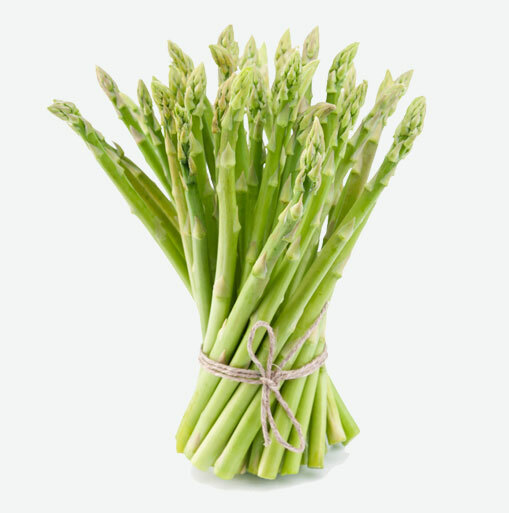 While it is not necessary to peel asparagus, the ends need to be cut off before cooking. Wash your asparagus under cold water to remove any sand or soil and drain well before cooking. You can tie asparagus stalks in a bundle to boil them, this will make it easier to remove the stalks when they are cooked. If you find you enjoy this nutritious and gourmet status vegetable so much that you become a true aficionado , you might consider purchasing one of the special tall, narrow steamers available in many stores.